Visit the Prayer Corner for more daily readings, prayers, a monthly calendar of saints and feasts, and more. Behold the Bridegroom comes in the middle of the night, and blessed is the servant whom He shall find watching and again unworthy is he whom He shall find heedless. Therefore, O my soul, beware, unless you be weighted down with sleep, unless you be given over to death and be shut out from the kingdom. 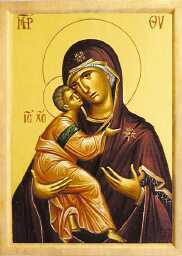 Rouse yourself, and cry: Holy, Holy, Holy, are You, O God: through the Birthgiver of God have mercy on us. Meditating on that terrible day, watch, O my soul keeping your lamp lit and filled with oil; for you do not know when the voice will come saying to you: "Behold the Bridegroom!" Therefore, my soul, beware, unless you fall in slumber and be left outside, knocking as the five virgins; but wakefully watch that you may dome to meet Christ with good oil, and He shall bestow on you the divine chamber of His glory. In 2019, Holy Pascha is celebrated on April 28th.